Electrical Engineering Solutions (EES) is using its offices as a technology proof-site to gather first hand experience of functionality, costs and energy savings associated with Rationalised Intelligent Lighting systems. By keeping detailed information pertaining to their installed lighting system, EES will be able to use this to help clients make informed decisions. The firm is determined, says managing director Bradley Hemphill, to use experience to promote proven concepts to clients. Based in Cape Town, South Africa, EES is an electrical engineering and project Management firm active mainly in the construction industry where intelligent infrastructure has become a crucial component. The intelligent lighting system is based on the DALI international standard which was formulated specifically for digital lighting control. It provides a single interface for all electronically controlled light sources in a versatile and easy-to-install system. Hemphill says that an immediate saving to the office lighting bill was 7 W/m2 or a saving of a monthly saving of 74 c/m2, based on 22days/month at 10hrs/day at the City of Cape Town tariff of 47,88 c/kwh for small and medium power users. For large power users the saving is similar and even more. “This saving will be supplemented by approximate consumption savings of the existing lighting load of 71 c/m2. We will prove this saving when our energy management system is installed and we start obtaining data. Return on investment for a complete retrofit installation with new automated luminaires (lights) is about six years, with replacement of ballast into the existing luminaires (if possible) about three years. In a new building, the premium over and above conventional lighting is between 20-30% and the resultant energy payback will be two years or less. The EES intelligent lighting solution was motivated by a need to demonstrate lower energy costs and create a better working environment for staff. “We chose lamps in the luminaires that are more efficient in lumen output and with a longer lamplife to give us lower cost of ownership,” says Hemphill. 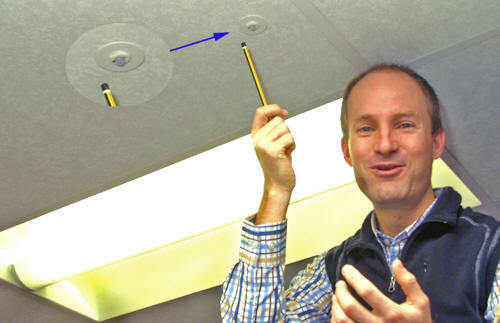 The multi-sensors EES installed in its office automatically adjust groups of luminaires according to how they have been programmed. Luminaires near windows take natural light into account when deciding how much power is require. Inner-office luminaires, clustered into a separate group from those near the windows, are powered according to their own energy needs. Light level and occupancy sensors communicate with the intelligent ballasts, and the appropriate energy is supplied for the desired level of light in that area. Lights in similar environments but in other rooms or locations on the company’s premises can be similarly grouped for efficient control. In EES’s office the lights have been programmed to be movement sensitive. If no movement is detected for a programmed period (say 15min), the lights dim to 1% of their rated power. When movement is detected, alerting the system to someone’s presence, they power back up to programmed level. enabling the light's output to be regulated. Hemphill stresses the ease of installation and management of an intelligent lighting system. In conventional lighting control, groups of lights with similar purposes are hardwired into a group control switch. This resulted in a complex wiring system that was difficult to install and maintain. With digital intelligent lighting, the intelligence is in the individually addressable digital ballasts. These can be accessed or controlled via any system that uses the DALI protocol. A stand-alone system of up to 64 devices, with a single DALI controller, capacity for a series of sensors, and a wall-mounted bell-press switch for manual programming of scenes, on the fly dimming control, and switching on and off. A network or up to 64 –devices (ballasts and sensors), controlled by a single DALI controller which is linked to a server via a serial port (RS485 or USB). Each ballast is allocated a unique address and is individually monitored and controlled. These addresses can be arranged into controlled functional-groups for convenience. Once the network is established each ballast can be told what to do and when, and it can feed back information about its operation. Information is fed from each ballast to the monitoring system which recognizes anomalies - such as lamp failures - and signals a maintenance need via alarms. This allows the facility’s manager to fine-tune the operation. Using the intelligent lighting approach it is straightforward to change the lighting requirements in physical space to suit the company’s changing needs for that space without having to re-wire the lighting. Hemphill says that digital lighting networks are more sophisticated than traditional lighting systems in regards to set up, programming and commission, but the pay-off to the client in ease of management and energy savings is worth the up-front investment.